Appearance: (6) While colorful, the ingredients were perhaps a little too partitioned off. Quality of Ingredients: (5) “Stone-ground” tortilla chips tasted like…tortilla chips. Tomato salsa was no where near as fresh as we had expected. Guacamole was average. Beans were from a can. Sensing a pattern here? Distribution of Toppings: (6) There was a ton of cheese on these nachos, and it got everywhere. Great, right? Well, only if the cheese is melted enough to actually make it into your mouth, instead of sticking together in a glob on the plate when you extract a chip. 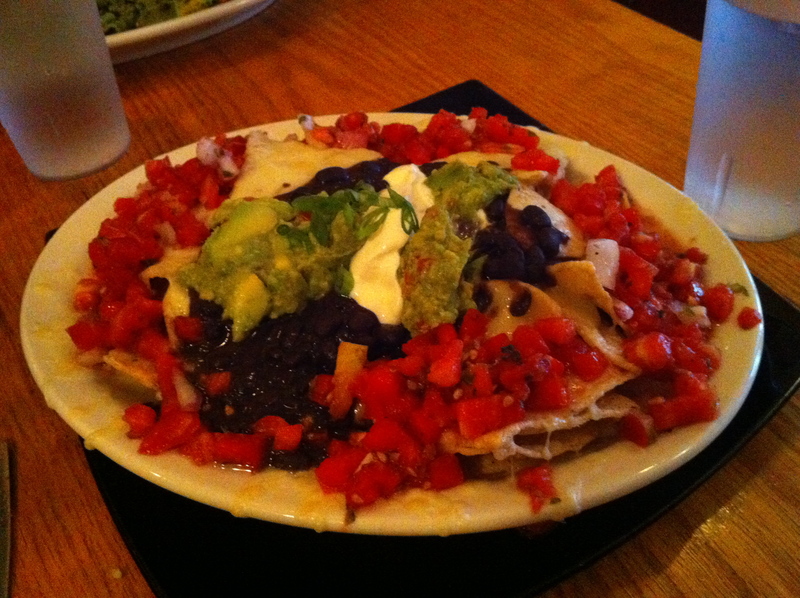 Having the beans and guacamole in sections made it difficult to get more than one topping on each chip. Price: (3) At $12 WITHOUT any extra toppings (chicken or tofu would be an extra $2), these were a bit of a giant ripoff. Overall: 20/40. It’s such a shame, with all the other interesting, delicious, moderately-priced items on the menu (we greatly enjoyed the polenta fries with chipotle ranch), that these nachos are such a mediocre, unimaginative mess. Centre Street Cafe needs to either give them some serious love and attention or just take them off the menu already.